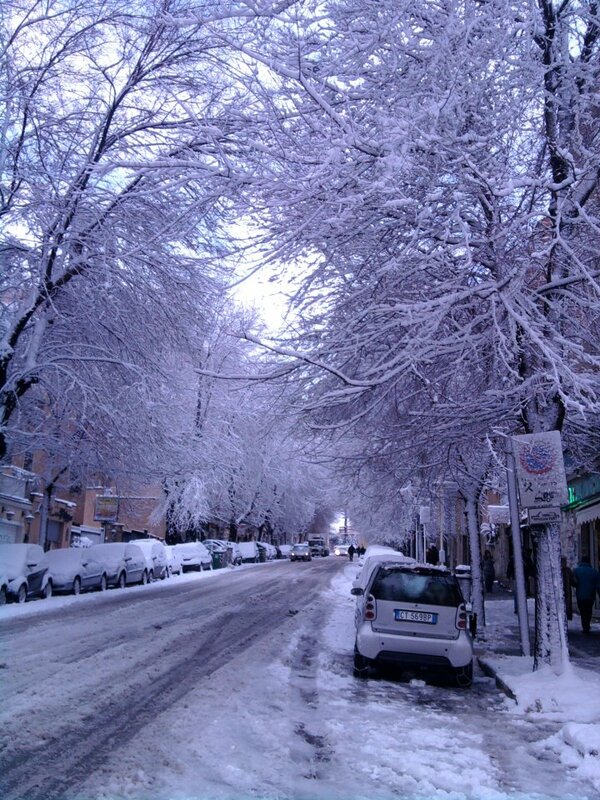 Rome has been paralyzed this week by a rare snowstorm. Usually when it snows here, the flakes melt before they hit the ground. Even if snow makes it all the way to earth, it disappears in a few minutes. But three days after the snow began falling here, it’s still clinging to the roadways and rooftops alike. It’s not that Italy doesn’t have snow. In February, people often celebrate “White Week” by taking a ski vacation to one Italy’s many mountains. It’s just that snow is so rare in Rome that most people don’t even own an ice scraper for clearing wind screens. From my window, I see many cars still covered with snow, which isn’t really surprising since it’s illegal to drive on Rome streets now without snow tires or chains—things most people don’t have unless they routinely drive in the mountains in winter. Rome’s mayor, Gianni Alemanno, is taking it on the chin for not being prepared. The civil protection service apparently warned him that the severity of the forecast warranted a plan, but he discounted it. He’s now being ridiculed for having 5,000 snow shovels distributed to the public and asking people to go out and shovel the sidewalks! Hardly anybody’s doing that because snow shoveling isn’t in Roman job descriptions. At many apartment buildings, for example, where a porter sweeps up litter from the sidewalk, snow and ice remain packed down from pedestrian traffic. A fake Tweet, supposedly from the mayor, read, “Snow emergency. Abandon the city. I’m already in Milan.” An enraged Alemanno is vowing an investigation and legal action. That is, if he isn’t forced to resign before he can initiate it. Shelves at grocery stores are empty. At a chain store near my home Sunday, there was not a single piece of fruit. Just a couple of wilted heads of lettuce. People are comparing it to bread lines during World War II. A bit of an exaggeration, perhaps, but it does reveal Italy’s weak infrastructure. Things are much worse in other parts of Italy. There have been a number of deaths. People have been stranded on trains. Power is out some places. Me? I'm worried about the serious threats to several agricultural crops, including wine and olive oil. That doesn’t bode well for my dining table next year. Interesting post, Patricia. Europe's strange weather is equal and opposite to the strangely mild weather we've had around D.C. this year. I grew up in PA where we always got snow, but I've lived around D. C. for over thirty years and am amused by the southern mentality of the area--which gets snow every year--but they act much like your description of the Rome population's reaction. Rome has an excuse--D.C. doesn't. Elaine, as someone else who lived in the D.C. area for thirty years--through two blizzards with more than three feet of snow, I must disagree with you. Yes, the area gets more snow than Rome, but except for the rare blizzards I referred to above, it doesn't usually get that much. Nothing like Buffalo, for example. The problem for the D.C. area is that's it's just that--an area--with a myriad of political jurisdictions involved in traffic management, etc. : the District, Maryland, Virginia, Maryland's counties, Virginia's cities and counties. Getting all these jurisdictions to agree on plans, an more importantly, to allocate funds for dealing with any crisis is not an easy task. The problem is exacerbated by the fact that drivers in the D.C. area come to snowfalls with a world of experience and inexperience. You have drivers in one lane from snowy Russia, while in the next are drivers with the experience of the Jamaican bobsled team. It's a difficult mix. 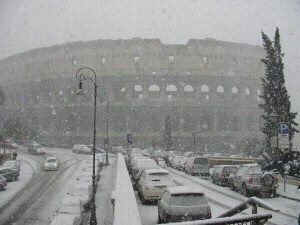 More snow is predicted for Rome soon. We're trying to cope.